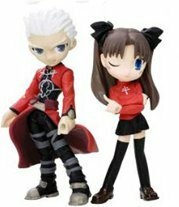 From anime series Fate/Stay Night, this is Fate/Stay Night : Archer and Rin Tosaka Nendoroid Figure . 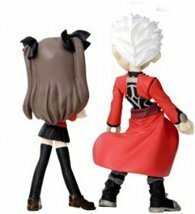 The Archer/Rin Palm Scenery figure set consists of two minature figures and quite a few accessories. The figures are of high quality and considerably cute, making an excellent addition to any TYPE-MOON fans’ collection. The Archer face scuplt is better than most as the character typically gets low quality sculpts in favour of the girls. Accessories include multiple alternate arms for Archer, Astoth, Kansho, Byakuya, Caldabolg II, and Archer’s bow. Archer (アーチャー, Āchā) is the Servant of one of the series’ main heroines, Rin Tōsaka. Due to an incomplete summon, he apparently has no memory of his previous life or identity. Archer is sarcastic and cynical – but under his hardened exterior lies a complex and dark personality that unfolds throughout the story. Though skilled with ranged weapons, he can hold his own in mêlée combat. Archer considers Shirō Emiya’s idealism to be weak and delusional, recognizing Shirō’s mentality of “wanting to save everyone” as naïve and impossible.